Delta State is part of the oil-rich Niger Delta – a region that has witnessed significant conflict between foreign oil corporations and the region’s ethnic groups. These struggles continue today, and the Niger Delta is most frequently referenced in international media in relation to oil and fossil fuels. Like the other core Niger Delta States, Delta State is also faced with environmental problems resulting from oil exploration and exploitation activities. These problems include abstraction of ground water, gas flaring, and oil spills and leaks. In addition, as a delta with many tributaries, and with low-lying coastal communities that are crisscrossed by waterways, Delta State is also highly susceptible to the impacts of climate change. However, there also many are positive stories emerging from the region. At the local level, Delta State has submitted an application to the Transformative Actions Program detailing a comprehensive program to tackle climate change and increase the sustainability of the State. 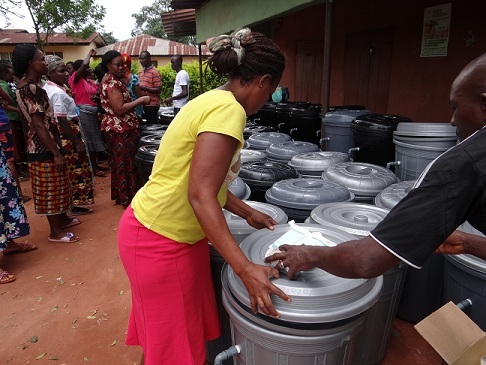 A woman receives a biosand filter. Delta State initiated the Territorial Approach to Climate Change (TACC) Programme in collaboration with the UNDP in 2010, and began implementation in 2012. The TACC successfully carried out a scientific study to ascertain the impact of climate change in the State, and executed some ‘quick win’ pilot projects on climate change mitigation and adaptation. The Programme was also able to develop the Delta State Climate Change Policy and an Integrated Territorial Climate Plan (ITCP). The ITCP brings together the scientific study, the quick win pilot projects, and other state level activities to develop a strategy and action plan. Health Promotion Training & Climate Change Awareness-raising Workshops in communities. 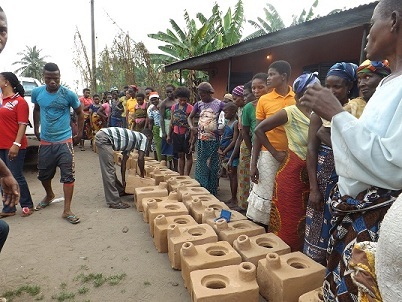 Ecostoves are distributed to citizens. These projects will address a number of issues within Delta State. For example, indoor air pollution from the burning of wood leads to respiratory and other health problems, so replacing the traditional tripod cook stoves with energy-efficient stoves (that use less wood and produce less smoke) and biogas digesters (that turn kitchen waste to cooking gas) will have a significant positive impact on the health of the people. Delta State’s plan recognizes that the most vulnerable communities are usually the rural and coastal communities, especially the ones that are not accessible by roads. The plan takes into account marginalized groups in order to avoid further marginalization and to ensure that, where applicable, these groups have full representation during trainings/sensitization. It also seeks to ensure that at least one marginalized household in each recipient community has access to the innovative technology (biogas digesters, eco-stoves, or biosand filters). The project activities are positioned to enhance social inclusion and environmental awareness, to create jobs, and to increase the income of vulnerable groups.